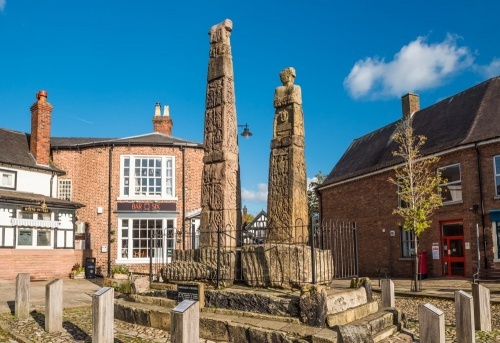 The Sandbach Crosses are a pair of 9th-century sculptured crosses. 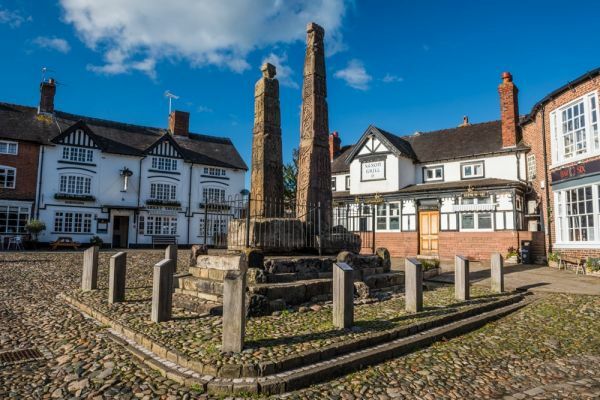 They are constructed of sandstone and stand side by side in the cobbled market place of Sandbach, ringed by attractive timber-framed buildings. 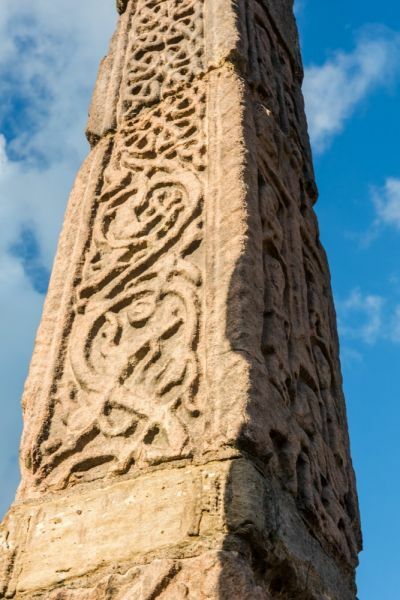 The crosses are elaborately carved in fine Celtic style with Biblical scenes, animal figures, and geometric patterns. Interestingly, it is thought that the crosses were originally painted, though no trace of any paint is apparent to the eye when you look at them now. If you can imagine the beautifully carved scenes brightly painted the crosses would have been an extraordinary sight! 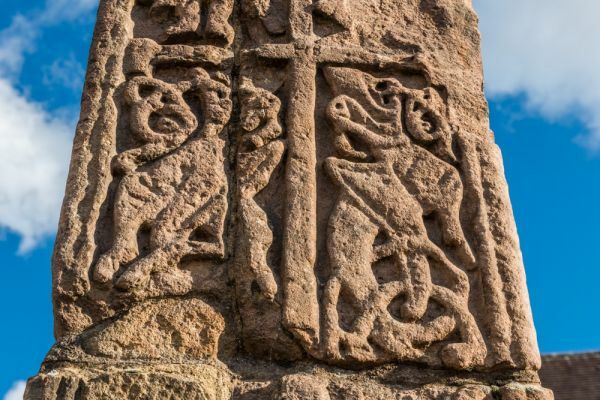 Together, the crosses represent one of the best surviving examples of Saxon carving in England. 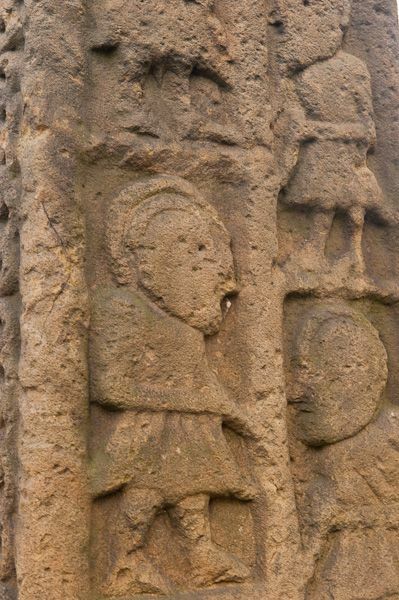 The larger north cross is carved with Biblical scenes. At the top of the east face is a scene showing the Three Magi appearing before Mary. Below this is a Crucifixion with the four gospel writers surrounding the cross, and Mary with St John the Disciple below. Below the Crucifixion is a Nativity scene, followed by a Transfiguration. Finally, there is a large circle depicting the Foundation of the Church, showing Jesus with St Peter and St Paul. All that is just one face of one cross! Some of the other carvings are more difficult to interpret, but there are human and animal figures interspersed with the ebullient geometric design so common in the late Saxon period. It is disappointing and perhaps a little surprising that we do not know more about the origin of the crosses. 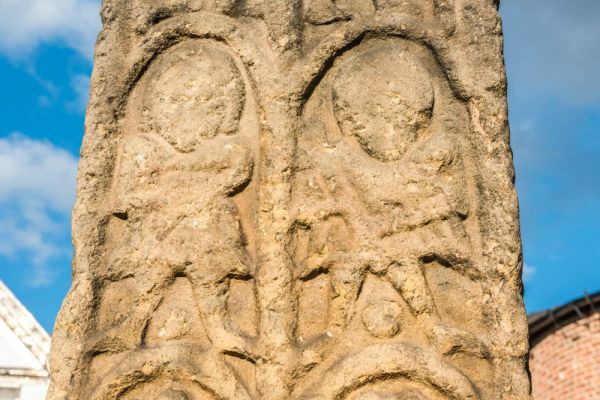 The information sign on the base of the crosses simply says that they were erected by King Peada of Mercia (d. AD 656) in AD 643 to proclaim the Christian message in an area that had only recently been converted to Christianity. In that respect, the crosses can be viewed as a sort of Saxon billboard - a visual retelling of the Christian story to a largely illiterate audience. The larger cross probably dates to the early 9th century while the smaller cross is a little later. 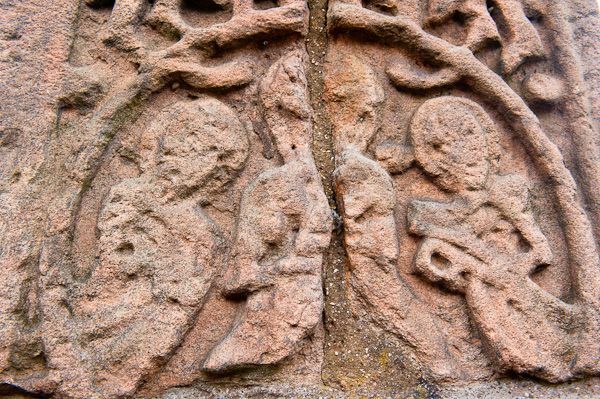 The beautifully-crafted carving has led historians to speculate that they may have been carved by a workshop of skilled masons attached to a monastery or minster church at Sandbach, linked to the Bishop of Lichfield. Another suggestion is that they were erected as very elaborate boundary markers, or that they formed part of ritual religious observances. During the religious upheaval of the 17th century the crosses were broken into pieces by Puritans and the pieces scattered across the region. Some fragments were incorporated into a neo-classical grotto at Oulton. The scattered fragments were brought back together in 1816 and re-erected in the market square under the direction of George Ormerod, a local historian. They stand on a stepped stone base. 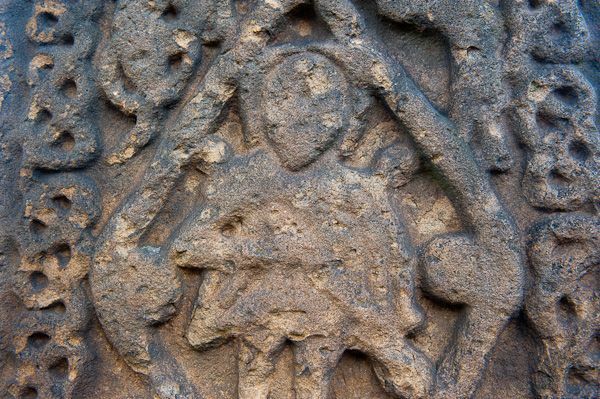 Other fragments of Saxon carving were placed beside the west porch of nearby St Mary's Church. The crosses are well signposted from the surrounding major roads, but in truth, it is hard to miss them - just head for the centre of Sandbach! 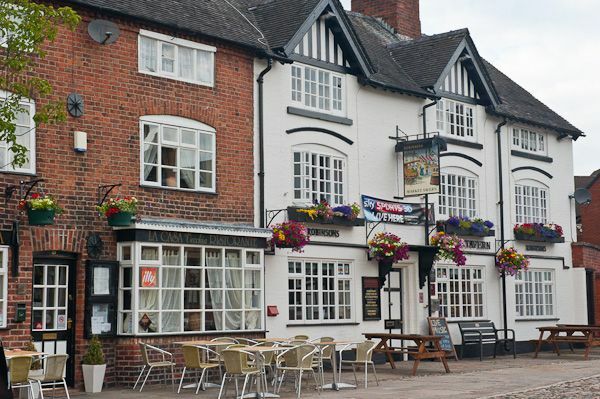 There is no dedicated parking area but the large town centre parking area is just a short stroll away. Location: In the market square, just off the A533. Open access site.